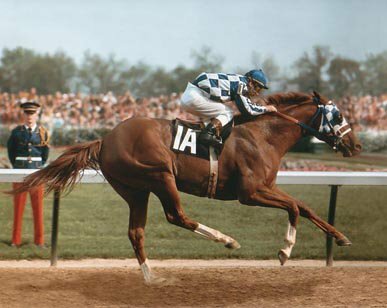 As part of his first crop at stud, Secretariat sired Canadian Bound, who was the first Thoroughbred yearling racehorse ever sold for more than US$1 million. At the 1976 Keeneland July sale, the auction bidding for Canadian Bound not only broke the $1 million barrier, but the colt ended up being sold for $1.5 million. He also sired General Assembly, who won the 1979 Travers Stakes at Saratoga while setting a still-standing race record of 2:00 flat. Andrew Beyer has said that General Assembly’s speed figure in that race was one of the fastest in history. Like Secretariat in the Belmont, General Assembly never duplicated that performance in another race. Many CEOs find themselves with a winning racehorse but a moderately profitable business model. These CEOs spend all their time, energy, and money trying to build a better race horse. Instead, they should focus on building a better stud horse. Quite simply, some business models are better than others. The race horse business model is inferior to the stud horse business model. Savvy horse owners understand that a winning race horse is a cost of entry into the lucrative stud horse business model.